In the comments of my last post, Rita said she still had a hard time understanding moving darts to the side seam, so this is a more detailed explanation. Again, I think it will be helpful for you work the examples shown with your own paper. Here’s our new piece of paper. You can see I’ve marked some dimensions on this piece. Each half of the dart is 1″ wide; from the edge of the paper to the edge of the dart is 3 3/8″, on either side. 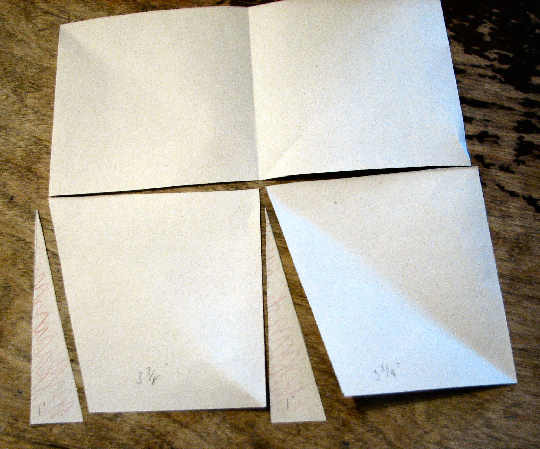 In this next picture, I’ve slashed the paper horizontally. I’ve also cut out the dart wedge (and colored it, front and back, with a colored pencil). Cut the wedge in half vertically. 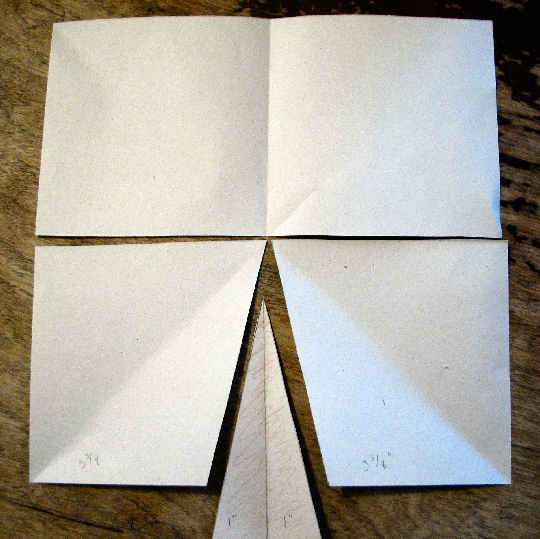 Next, flip over the left hand corner of the paper–this makes the diagonal line of the dart face the side instead of the center. Also take half the wedge, flip it over, and make it fill the diagonal gap. Now do the same thing to the right side. What have we accomplished? The amount taken out (the wedges) is still the same. 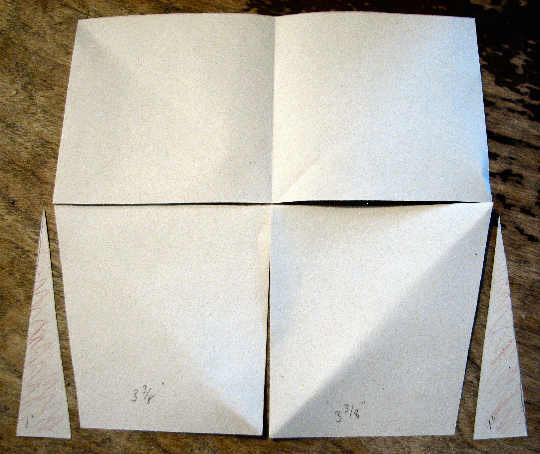 But instead of one wedge in the center of the piece, there are two smaller wedges at the sides. The width across the horizontal slash is still the exact same length, and width across the bottom (sans the wedge, regardless of how it is destributed) is still the same. However, this technique should be used with caution. As when making princess seams, this isn’t really a removal of darts, just a moving and hiding of darts. Conventional darts always point to the bulge or bump–the apex. It isn’t a matter of where you want darts to be, but a matter of fact: where ever the dart is pointing creates the highest, fullest point in the fabric shape. 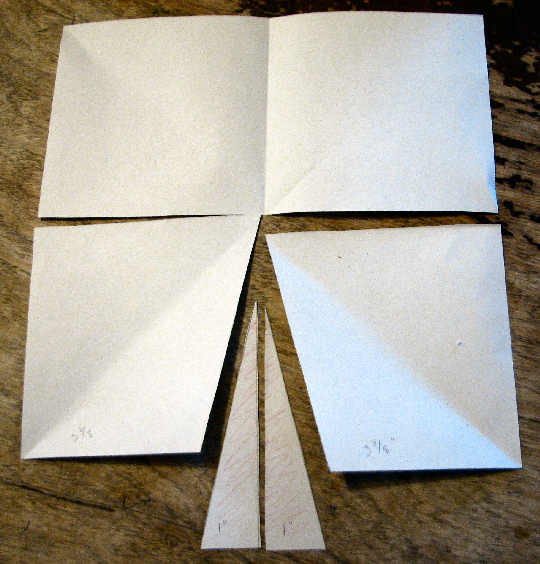 So if you move the darts to the side seams, even though the width measurments are the same, the darts are “pointing” at the side seams, not toward the apex (as, in our example, the center of the paper is the apex of the shape we wish to create). The less shaping that is required (the smaller the dart), the more likely you’ll be able to use this technique without problems. The larger the dart, the more you may have problems with distortion or wrinkling. 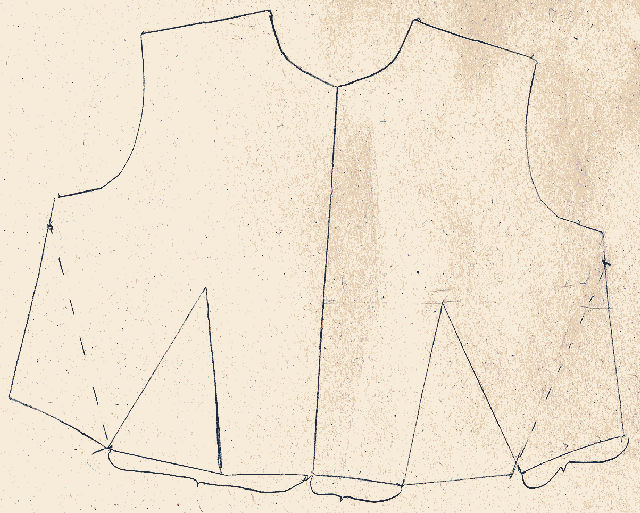 You should always do a test muslin when experimenting with moving darts to the side seam, to see whether or not you are getting your desired results. 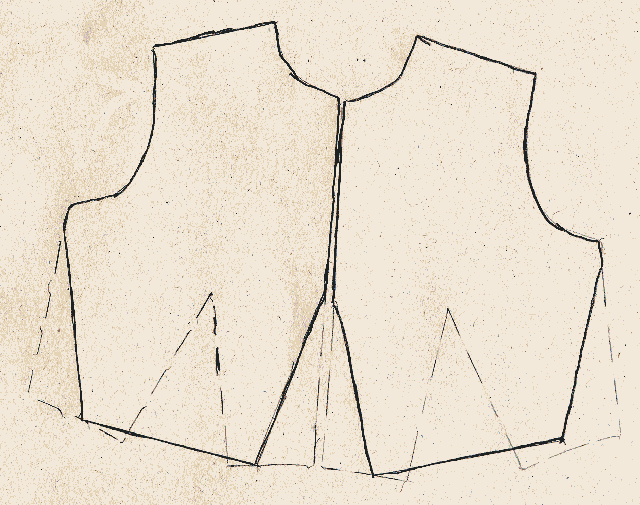 The solid lines are the original sloper, with two vertical darts, pointing from the waist up. The dashed lines are how we will alter this sloper. We will not sew the existing darts. We measure the base of a dart, and mark that from the corner inward. We measure the height of the existing dart, and mark that from the corner upward. We draw a diagonal line connecting those marks. That is the dashed line. 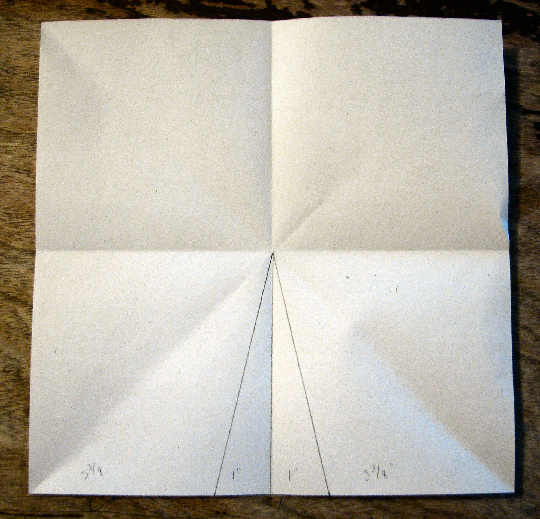 As with our paper example, the distance from the dashed line to the center line is the exact same length as the distance from the center front to the beginning of the dart plus the distance from the end of the dart to the side seam. The width across the bust is also the same. But the darts haven’t just “disappeared”–they’ve been moved to the side seams. The side seams are not where your apex is, so you may have issues with distorting or wrinkling. To help avoid having that problem, it’s wiser to have a center front seam, and rotate half the dart to the side seam and half the dart to the center seam. In this case, the dashed lines are the original sloper, and the solid lines are how we’ve changed it. Again, the width remains the same, and the amount taken out is also the same. But instead of making huge darts at the side seam, there are smaller darts at the side seam and smaller darts at the center front. It generally always holds true that the larger a dart is, the wiser it is to break it up into several smaller darts. I think that’s doubly important when rotating darts to the side seam. Rita, I hope that clears things up for you. If it doesn’t, please let me know. Please whats the main advantage of sending darts to side seams? and does it give any shape or does it give similar effects like a dartless pattern? Hi Queen, I don’t know if you’ll see this since I somehow lost your comment in the sea of spam on my nearly defunct blog. . . the main advantage of sending darts to side seams is just less interruption to the fabric for design’s sake. It does give some shaping, but the more shaping you need, the less this will be an effective method for you. Hope that helps!